I just invested $54.50 on the cliquey deputee pack and another $7.50 on 50 rentals as well so i would have 100 rentals total. 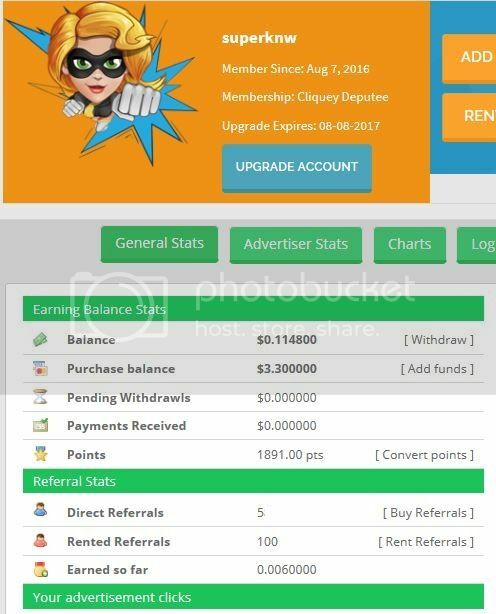 (08-08-2016, 10:10 PM)superknw Wrote: I just invested $54.50 on the cliquey deputee pack and another $7.50 on 50 rentals as well so i would have 100 rentals total. Bro i have also invested few bucks here and believe me earnings on clique media group is very good but recently cliquestria has started delaying payments...i don't know why. They have just launched 3rd site too and as far as i know that they all are doing well with advertisers too but let's see what happens. Yes there is huge delays in payments on Cliquesteria. It takes up to 5 - 7 days to get paid by them. What percentage of RR is required to extend RR in standard member ? ?